Our amazing niece Sana Rashid from Toronto, Canada ordered her Bridal, Nikah and Mehndi outfits from chambeili Bridal. The outfits were custom designed from our leading designers Faiza Saqlain and Zonia Anwaar. Nida’s Nikaa and Mehndi outfits were designed by Zonia Anwaar as well as all the girl’s side Mehndi outfits. 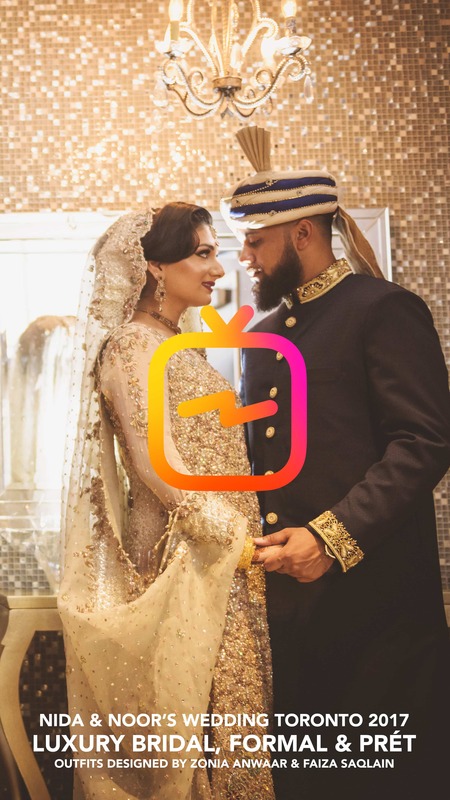 For the main wedding day, Faiza Saqlain designed the bridal and bride’s mum’s outfit. All the bridesmaid gowns were designed by Zonia Anwaar. Designing outfits for international clients is extremely challenging and this being our first ever niece’s wedding made the task even harder as we had to cover all 3 events. However, with over 6 years experience of working with both Faiza Saqlain and Zonia Anwaar and our experience of making hundreds of outfits in the past, we followed our model and delivered the highest quality of garments for our niece and family.